Over the years I have had the opportunity to lead workshops at the annual Birthmom Buds Retreat that is held in Charlotte, NC. This retreat weekend is always held the weekend before Mother’s Day and birthmothers all over the country come together for a fun filled weekend full of laughs and shed tears with those who fully understand the emotions that come along with this side of the adoption triad. Each year I try to lead a different workshop to help other birthmothers in attendance think about their adoption journey differently. Topics such as Self-Care, Finding Your Support System, Life after Placement. In 2015, I was honored to be the chosen Keynote Birthmom at the annual retreat. 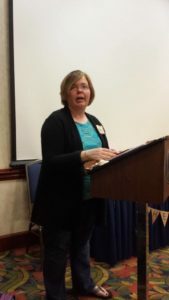 Besides speaking for Birthmom Buds, I have had the opportunity to speak at other adoption events. In 2013, I was on a Birthmother Panel at the American Adoption Conference which was held in Cleveland, Ohio. I am one who has never been nervous speaking in front of others when it comes to adoption as it is an important part of my life. I look forward to participating in future events.